Everybody who wants to protect his tackle against wetness entirely, needs Tarpaulin materials. 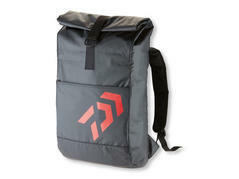 The DAIWA wrap rucksack is waterproof. Carrying handle and back are padded to enable a comfortable transportation of even heavy charges. The wide aperture is rolled up and saved via hook and loop fastener to close the rucksack. Ideal for boat fishing!